system between winners and losers, it is not ubiquitous. 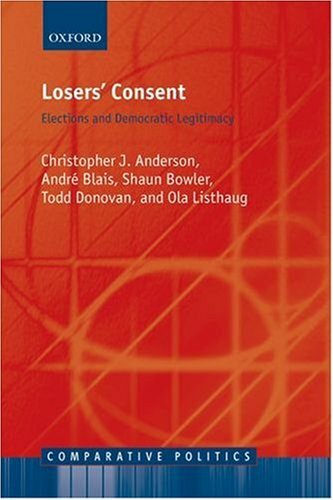 The book paints a picture oflosers' consent that portrays losers as political actors whose experience and whose incentives to accept defeat are shaped both by who they are as individuals as well as the political environment in which loss is given meaning.Given that the winner-loser gap in legitimacy is a persistent feature of democratic politics, the findings presented in this book contain crucial implications for our understanding of the functioning and stability of democracies.Comparative Politics is a series for students and teachers of political science that deals with contemporary government and politics. The General Editors are Professor Alfio Mastropaolo, University of Turin and Kenneth Newton, University of Southampton and Wissenschaftszentrum Berlin . The series is published in association with the European Consortium for Political Research. Christopher Z. Mooney and Daniel A. Smith) of STATE AND LOCAL POLITICS: INSTITUTIONS AND REFORM (?2009) and coauthor (with Ken Hoover) of THE ELEMENTS OF SOCIAL SCIENTIFIC THINKING, also published by Cengage Learning.